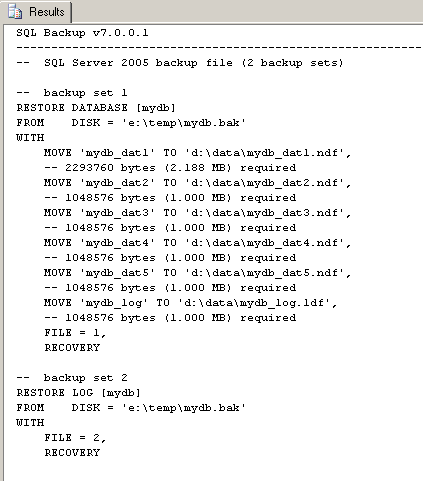 The following is not a supported feature in SQL Backup, but it's there. You want to restore a full database backup, but want to move the data and log files to different locations from the original. Your database contains multiple data files, and you need to move them one by one e.g. That's a lot of typing, more so if your database contains an even larger number of files. The usual practice is to run the RESTORE FILELISTONLY command to get a list of the database files, and copy/paste the file names into your restore command. 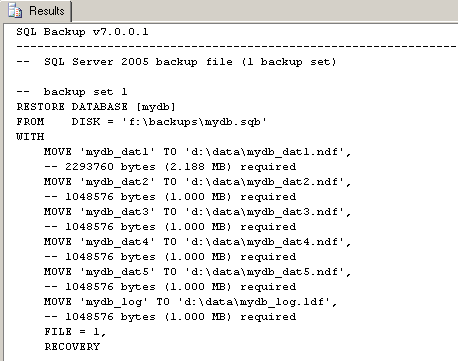 If you just wanted to move all the data files to one directory, you could use SQL Backup's MOVE DATAFILES option. However, you cannot use that option if you want to move the data files to various different directories. Then all you have to do is to make your changes, edit the restore template so that it can be ran as a SQL Backup command (remove the commented lines and replace the single quotes with 2 single quotes), and you're done. Note that the template also tells you how much space each file requires, so you can organize your files better. Finally, RESTORE HELP works for native backup files too, even those containing multiple backup sets. E.g.